Habit: Perennial herb, generally cespitose, often rhizomatous. Stem: generally erect, 5--180 cm. Leaf: ligule fringed or short-hairy; blade flat or inrolled, margins not thickened. Inflorescence: terminal, generally panicle-like, open to dense, or spike-like. 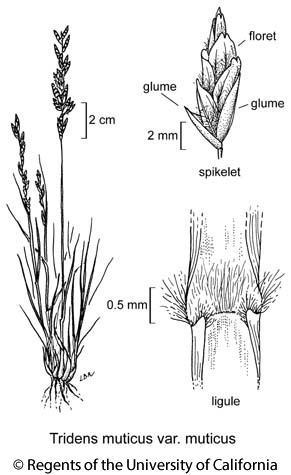 Spikelet: laterally compressed; glumes +- equal, membranous, lower 1(3)-veined, upper 1--3(9)-veined; axis breaking above glumes and between florets; florets generally 4--11; lemma wide, thin, back rounded, veins hairy below middle, 3-veined, tip notched or 2-toothed, generally short-pointed; palea generally < lemma, glabrous or minutely hairy below; anthers 3, red-purple. Habit: Plant tufted, shortly rhizomatous. Stem: generally 20--50 cm. Leaf: sheath hairy, especially near collar; ligule short-hairy; blade 3--25 cm, 1--4 mm wide, generally inrolled, +- fine scabrous, sometimes sparsely hairy. Inflorescence: 4--20 cm, 3--8 mm wide, narrow; branches short, appressed; spikelets subsessile to short-stalked. Spikelet: 8--13 mm, +- cylindric; glumes 3--10 mm, lower 1--3-veined, upper glume 1-veined; florets 5--11, strongly overlapping, pale to light purple; callus densely hairy; lemma 3--7 mm, generally purple-tinged, veins densely hairy below middle, tip entire to minutely notched; palea margins hairy, < lemma. Chromosomes: 2n=40. Citation for this treatment: James P. Smith, Jr. 2012, Tridens muticus var. muticus, in Jepson Flora Project (eds.) Jepson eFlora, http://ucjeps.berkeley.edu/eflora/eflora_display.php?tid=67245, accessed on April 19, 2019.
ne PR, D; Markers link to CCH specimen records. Yellow markers indicate records that may provide evidence for eFlora range revision or may have georeferencing or identification issues. Purple markers indicate specimens collected from a garden, greenhouse, or other non-wild location.